Gift exchange is part of festive celebrations for many people in the modern world, including many traditions whose gift-giving season has just passed. In the pre-modern world, though, gift exchange was often a vital part of social, political, and economic life. The essential principle of gift exchange is reciprocity. Giving someone a gift obliges them to return a gift of equal value. In the modern market economy in which every item can be assigned a monetary value, this is cause for anxiety (and comedy) over gift-giving, but in earlier societies value was measured in other ways. The value of a gift often depended on the prestige of the person giving it. Since gifts were reciprocal, they created a relationship, of which the gift acted as tangible proof. The modern taboo against asking the price of a gift (“Don’t look a gift horse in the mouth”) attempts to reinforce this kind of value in a monetized world. Gifts could acquire prestige of their own. In the Odyssey, for example, when Menelaus presents a cauldron as a gift to his guest Telemachus, he recounts the object’s history. Gifts of this sort were often not intended to be used at all but were precious tokens passed from one noble to another creating a web of social relationships (rather like the “mathoms” enthusiastically given back and forth by Tolkien’s hobbits). Being known as a generous giver of gifts was an important mark of distinction in traditional societies. Gift-giving could even take on a competitive edge, as in the potlatch ceremonies practiced by some native peoples of the Pacific northwest. While there are many local and tribal variations on potlatch, the ceremony was often traditionally used as a venue for displaying the wealth and power of a family by the richness of the goods that it could give away or destroy. Rival families competed to offer the most lavish potlatches as a way of establishing their relative power and status. Gift-giving was thus a form of conspicuous consumption. Stinginess with gifts was, by contrast, a dishonor to be avoided. Gifts could also be perilous because of the social obligations they came with. In small-scale societies, such as Viking warrior bands, chiefs secured the loyalty of their followers by keeping them supplied with gifts both of a practical and symbolic nature, such as weapons, clothing, mead, and jewelry. The warriors who received these gifts, unable to return a material gift of equal value, made a gift of their service and lives instead. 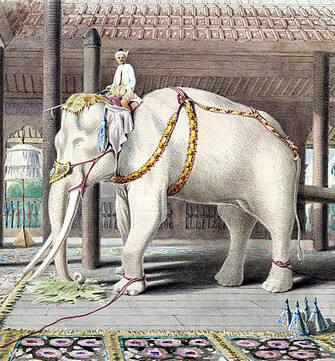 Just as gifts could draw people close, they could also push them away, such as the white elephants reportedly given by the kings of Siam to troublesome courtiers. Since elephants are expensive to maintain but white elephants were held sacred and by law could not be put to work, the gift of a white elephant could be ruinous to the recipient. At the same time, a gift from the king could not be refused. The formal rituals of gift exchange could also serve simple economic purposes. In non-monetary economies, trade is often accomplished in this way. The kings of ancient Egypt, for example, arranged exchanges of trade goods with neighboring states by presenting the goods in question as a gift. The rise of money has reduced gift exchange in the modern world to a sentimental tradition, but in societies that are less dependent on money, gift exchange has a much greater prominence as a social and economic tool. Characters who live in such a society should be alert to the many meanings and ramifications of gifts. A gift can be a gesture of kindness and approval; it can also be a snub or a boast. It can be a demonstration of power or an overture for trade. Objects received as gifts might be treasured and passed down in the family or they might be given away again at the earliest opportunity. How characters make gifts and how they respond to them can say a lot about who they are and how they fit into the world they live in. For people who lived in a gift-giving culture, gifts were in themselves a form of communication. They could interpret the significance of how a gift was presented as deftly as we can parse the minutiae of texting etiquette. Part of making an imagined world feel authentic is making the interactions of its characters feel real. If you’re writing a pre-modern fantasy world, try including gift exchange as part of how your characters communicate with each other.